The Prospect Park Residence assisted living facility on Prospect Park West and Grand Army Plaza in Park Slope. PARK SLOPE — Elderly residents of a Park Slope senior home will have to pack up because the facility is closing in 90 days, shocked tenants and their families were told Wednesday night. Officials at Prospect Park Residence announced at a meeting that the 130-bed assisted living facility will close because of an "increased tax bill" that made operating the home "no longer viable," said Judy Willig, whose 90-year-old mother, Ruth, lives at the home. "Everybody is just stunned," Willig said. "You’re talking about really frail older people who have developed a community, and in 90 days that won’t exist." Prospect Park Residence Executive Director David Pomerantz said the decision to close "was not an easy one" in a statement released to DNAinfo New York through a public relations firm. 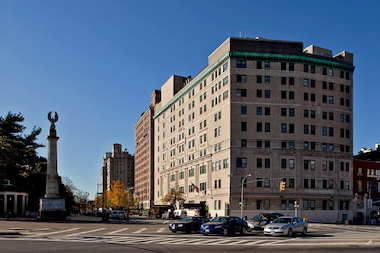 "Since 2009, Prospect Park Residence’s ownership and management have taken extraordinary steps to ensure a stable and predictable environment for its residents and staff by absorbing escalating costs," Pomerantz said in the statement. "However, five years later, the economic recovery remains sluggish and the company’s tax obligation has sky-rocketed — increasing by nearly $1 million," he added. "Today, despite its best efforts, Prospect Park Residence is no longer viable." Park Slope elected officials slammed the impending evictions and called on the building owner, real estate developer Haysha Deitsch, to halt the closure. "To throw our elderly neighbors out on the street is cruel, heartless, and unacceptable," said City Councilman Brad Lander, State Assemblywoman Joan Millman and State Assemblyman Jim Brennan in a joint statement. Willig said Prospect Park Residence officials read from prepared statements at Wednesday's meeting and were "vague" when tenants asked follow-up questions. Facility officials said they would work with tenants to help them find new places to live, according to a document that was handed out to residents. The State Department of Health, which oversees assisted living facilities, approved the closure plan after "comprehensive review," a spokesman for the agency said via email. He added that DOH will work with facility managers "to ensure the health of residents is protected and they are safely relocated to the most appropriate level of care." One woman at the meeting said she had moved her aunt into Prospect Park Residence just two weeks ago, Willig said. The assisted living facility was named as one of the city's 20 best by New York magazine. It's known for caring for frail seniors, many of whom suffer from dementia or cognitive impairment. "We all have trouble dealing with change, but to do that at the end of your life, it's just cruel," Willig said. The nine-floor Prospect Park Residence sits on prime real estate overlooking Prospect Park, on the corner of Prospect Park West and Grand Army Plaza. It's around the corner from a high-end condo building that opened in 2012, and down the block from where actress Chloe Sevigny recently bought a $2.2 million apartment. Rumors have swirled for years that the building could be sold and converted into condos, Willig said. The building's future wasn't explicitly addressed at the meeting, she said. Public records show that the building was purchased in 2006 for $40 million by an LLC registered to Deitsch. He could not be reached immediately for comment on Thursday.